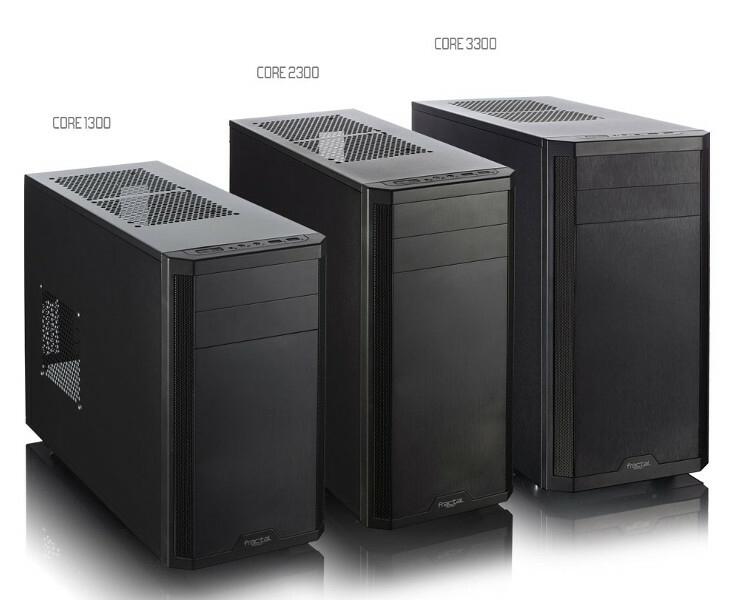 Fractal Design's Core family of cases have always been centered around providing the core features and performance of Fractal Design’s case lineage at an aggressive price point. Core has undergone an evolution thanks in part to the valuable feedback from our customers. An innovative vertical hard drive bracket can fit a total of six drives - three 3.5" drives and three 2.5" drives. In addition, two additional SSD drive can be placed behind the motherboard tray. An innovative vertical hard drive bracket can fit a total of six drives - three 3.5" drives and three 2.5" drives. An additional 2.5" SSD mounting is available behind the power supply position. The Core 1300 is the extremely compact micro ATX Mini Tower of the x3 Series Designed for exceptional airflow and cooling. The case is equipped with two pre-installed Silent Series LT 120mm fans and can support both 280mm and 240mm water cooling radiators. An innovative vertical hard drive bracket can fit a total of four drives - two 3.5" drives and two 2.5" drives. An additional 2.5" SSD mounting is available behind the power supply position. Despite its extremely small outer dimensions, the Core 1100 mATX case provides everything you need. The stylish, Scandinavian exterior design is matched by the fully painted interior, complete with the signature white details of Fractal Design. The case is optimized for airflow with a straight cooling path, and comes equipped with a pre-installed 120mm fan. The front panel is equipped with dust filters. An innovative vertical hard drive bracket can fit either two 3.5" drives, three 2.5" drives, or one drive of each size. Both the 3.5" drive slots come with silicone vibration dampening grommets.